yup!, that's all paul. but as you can see, paul only scored 17 points. that means somebody from the hornets took the responsibility of scoring and that guy is david west who scored 30 for the number 2 seed hornets en route to to a 110-82 win over the san antonio spurs. peja stojakovic added 22 while tyson chandler grabbed 15 rebounds. as for paul, he was in foul trouble in the first half with three personal fouls before halftime. cp3 also struggled from the field missing all his jumpshots in the first half. he came alive in the second half and finished the game with 17 points and 13 assists. early on, the spurs' three point shooting had the hornets trailing. bruce bowen hit five out of ten from the three-point range. the defensive specialist took no shot inside the arc and finished with 17. unfortunately for the spurs, bowen wasn't able to continue his hot shooting in the second half. one reason for the spurs losing in game 1 is tim duncan's poor shooting night. duncan missed all 5 jumpers and only made one out four layups as well as making only 3 out of his 6 freethrows. duncan had his worst playoff game ever with only 5 points and 3 rebounds to show for 39 minutes of play. for the hornets, david west's dominance inside the paint is one of the key to this W. the all-star forward made 13 of 23 shots. also, gawen deangelo, once again played well against the spurs... gawen who? hehehe.. that's bonzi wells' given name. 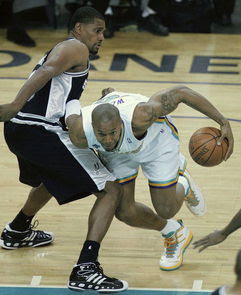 bonzi wells scored ten points in 19 minutes for the hornets. 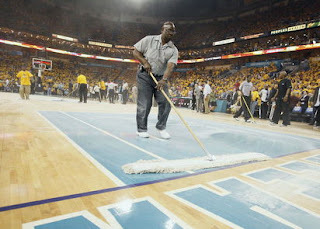 game 2 will still be played in new orleans and i hope the hornets win another one. geaux hornets! 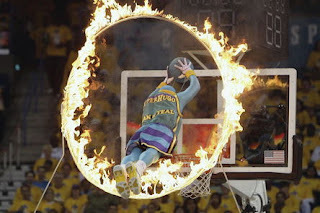 the game was delayed after the first quarter after a 'ring of fire' through which the hornets mascot, super hugo soared for a dunk refused to cooperate with the maintenance crew's attempt to put it out with carbon dioxide fire extinguishers. out came the foam fire extinguishers which resulted in a messy fire-fighting campaign which left the floor all littered up with the remnants of the flaming hoop and foam of course.